The Project Manager Development Program (PMDP) is for early-career project managers or those looking to move into such a role. It is a five-course program that covers the essentials of project management and provides a solid foundation for long-term career development. Each unit is around 16 hours of content, making the 5 course program around 80 hours of instruction. The curriculum is offered at many of AGC's chapters nationwide or can be brought in-house to construction firms and educational institutions in order to teach a new generation of project managers the essential skills to ensure project success. To register for classes please follow the following steps below. 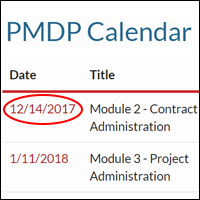 After navigating to the PMDP Course Calendar find an upcoming course and click on the date to view the class details. 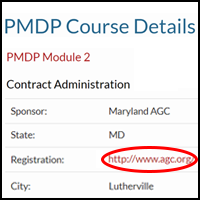 If you cannot locate an PMDP course in your location, we recommend contacting your local AGC chapter using the Chapter Finder, and request the course be scheduled in the future. If you have a large group to train, you can bring the courses in-house to your organization. Click here to see how you can bring AGC’s Project Manager Development Program to your organization. Click the links below to learn more about each unit.